Lately we have reading about a theatre on the Lower East Side of New York called Shakespeare in the Parking Lot, presented by The Drilling Company. We love this idea and feel it is important because it represents a great truth about theatre—theatre can be anywhere! And it also brings to mind a great proponent of this theatre: Margo Jones. Margo was a very successful Broadway director. 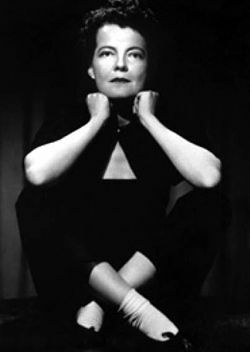 She co-directed the original Broadway production of Tennessee William’s The Glass Menagerie. She also directed the first Broadway production of Tennessee Williams Summer and Smoke and Ingrid Bergman in Joan of Lorraine. At that point she was able to create her dream of running a reparatory theatre in Dallas called Theatre 47. This was America’s first modern non-profit professional resident theatre—and one of Margo’s greatest visions! She set the stage for off-Broadway productions to flourish, be it under an apple tree or in a parking lot!